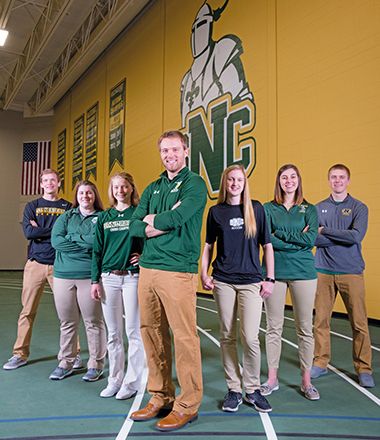 Eleven SNC student-athletes earned an Elite 20 Award from the Midwest Conference this year, shattering the program’s previous mark for one season and more than doubling St. Norbert’s five awards for 2016-17. Green Knights have received 18 MWC Elite 20 Awards in the three-year history of the award – 10 more than the next closest school. The Elite 20 awards represent academic and athletics excellence combined and are reserved for just one athlete per sport. The Green Knight MWC Elites represent between them 11 sports – by far the best representation of any school in the conference. St. Norbert’s award winners were (to the left in our photo) Josh Koleske ’20 (men’s soccer, biology and psychology), Megan Lau ’19 (women’s golf, music education); (to the right) Graceanne Tarsa ’19 (women’s cross country, biology and mathematics, Ellie Lochner ’20 (women’s soccer, mathematics), Samuel Staehling ’20 (football, biology); (not pictured) Taylor Penn ’19 (men’s basketball, biology), Maddie Uhlenbrauck ’20 (women’s tennis, business administration), Alex Vandenberg ’19 (men’s tennis, accounting and economics), David Jensen ’18 (men’s golf, communications), Jack Maastricht ’20 (baseball, economics and mathematics) and Kelly Heniff ’19 (women’s outdoor track & field, education). To top off this bounty, Clay Van Diest ’19 (center in our photo) garnered the NCAA Elite 90 Award for Division III men’s ice hockey. Learning how much effort is needed to keep up with college coursework compared with high school is a challenge that soccer player Koleske expects to escalate even further when he enters medical school. St. Norbert’s 11 Midwest Conference Elite 20s for 2017-18 came out of 18 possible opportunities, since the college will not offer swimming until next year. Eligibility is limited to athletes who compete at the conference championship level or have their team advance to the final four in a team sport. Clay Van Diest ’19 had to restart his academic engine when he arrived at SNC to play hockey. Van Diest had spent five years pursuing his hockey dream in the Canadian junior leagues. Carrying a 3.95 GPA while majoring in English education with a theology minor, Van Diest staked his claim as one of the nation’s top student-athletes by earning the NCAA’s Elite 90 Award for Division III men’s hockey. The award goes to the Frozen Four competitor with the highest GPA. “I took some online classes before coming to St. Norbert, and that helped me get into the swing of things,” Van Diest says.